Kemaro Island is a tiny delta of Musi River, located about 6 kilometers downstream of Ampera Bridge. 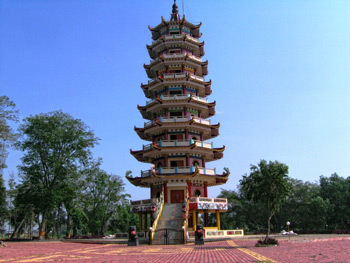 There is a Chinese vihara (klenteng Hok Tjing Rio) on it. Kemaro Island lies between the industrial areas of Sriwijaya Fertilizer Plant and Pertamina Oil Refinery in Plaju and Gerong River. Forty kilometers from Palembang, Kamero Island is a popular recreation site in the middle of Musi River. On the island there is a Buddha temple that often visited by Buddhists to pray or to visit the graves. Beside that, there is also mean of foretelling one’s life and marriage. A great religious event Cap Go Meh is held in Kemaro Island every Imlek New Year. Kemaro Island, a small island with a Buddhist temple and the grave of a Palembang princess. The legend tells that the princess was sent to marry the king of china. When she arrived, boats with big pottery pots were sent ashore. The king expected gold and opened them, but the first one only had vegetables. He ordered the other pots to be thrown in the river. When the princess saw that happening, she jumped in the river and drowned. Several of the pots broke, and they indeed contained gold. The princess was buried on the island, and the temple, which is built next to it, is said to bring luck.